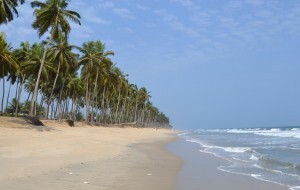 I am happy to report that all is going well in Ghana! I have been here for about one month. 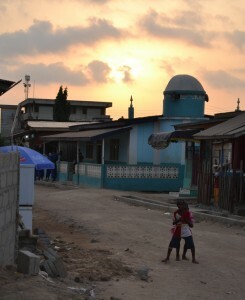 Ghana is hot, the people are friendly and kind, the children are wide eyed and curious and there is a feeling of being “in the right place at the right time.” I have been staying in Cape Coast, about 3 hours West of Accra, the capital, and focusing the work of this years Peace Exchange on schools in this area. In the past couple weeks I have visited six schools and worked with more than 800 students. In the next two weeks I will be in 10 schools in 12 days and completing a huge portion of this years project. 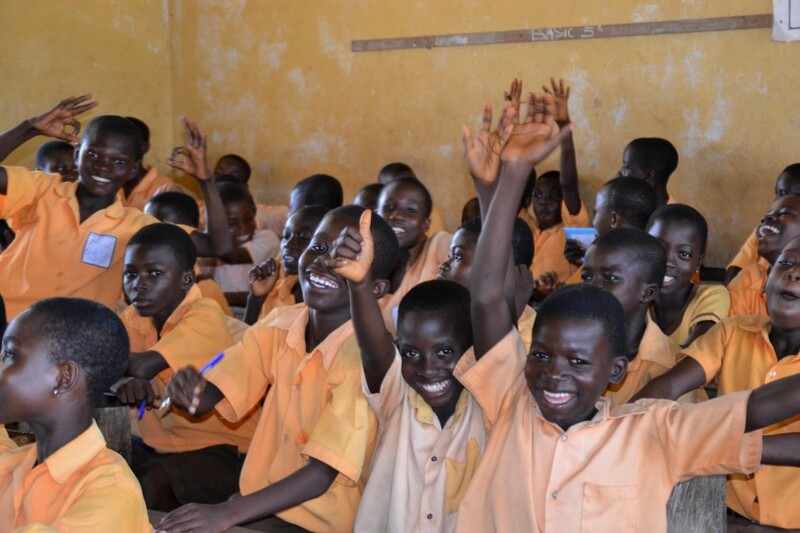 A few things I have learned: Students in Ghana public schools are not properly equipped to learn. Most do not have pens/pencils on a daily basis with which to write. Text books are rare. Teachers focus primarily on a call and response system of teaching, or writing on the board and having the students copy into their books (if they have a notebook or writing increment to use) Most children in Primary 4 and below are still struggling to read and write. Many of the postcards do not have messages on the backs and this is sad, and a reality of the education system here. Children in Ghana certainly DO NOT have art as part of their eduction and thus there is tremendous excitement to participate in The Peace Exchange, and yet a very primitive capacity to express ones self through drawing. I find that the students behavior is consistently good: loving, attentive, curious, and shy. When asked to share their ideas openly, there are only a few students willing to do so. This seems to be a result of the excessive emphasis on call and response learning, rather than having a more interactive sharing, communication between teacher and student. Some of the positives are the students are super bright and caring, extremely curious and polite to the tall white man at their school, have beautiful, loving hearts and are eager to see photos and art work of students from the US and Canada. I find their capacity to sit quietly and meditate is remarkable and indicative of their discipline and respect, which is an awesome quality. 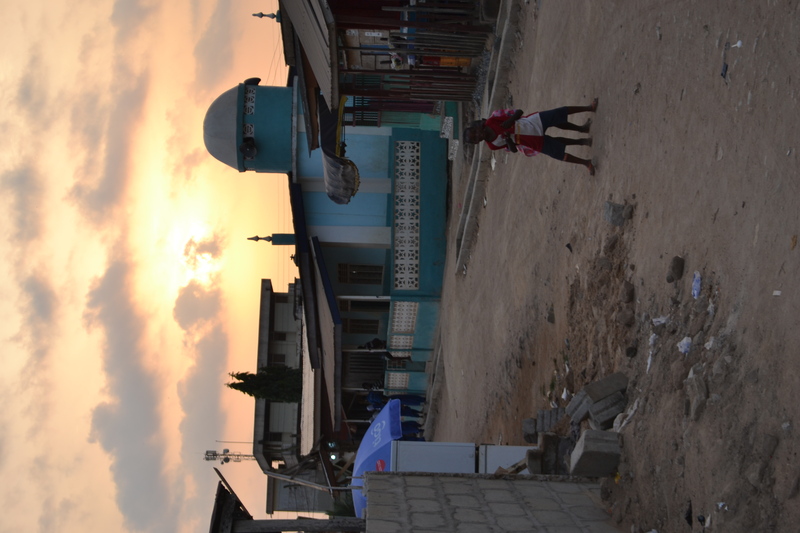 2013 Peace Exchange in GHANA! I’m here! 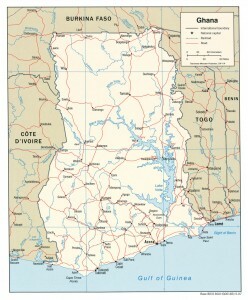 I’m in Ghana. It’s hot and it’s muggy….and it’s Great! Welcome to Ghana! I am honored and excited to be here. Create Peace Project will be partnering with Africana Child Foundation in Cape Coast, where I will be based for the next two months. This is an exciting time and a different type of Peace Exchange compared to years past. 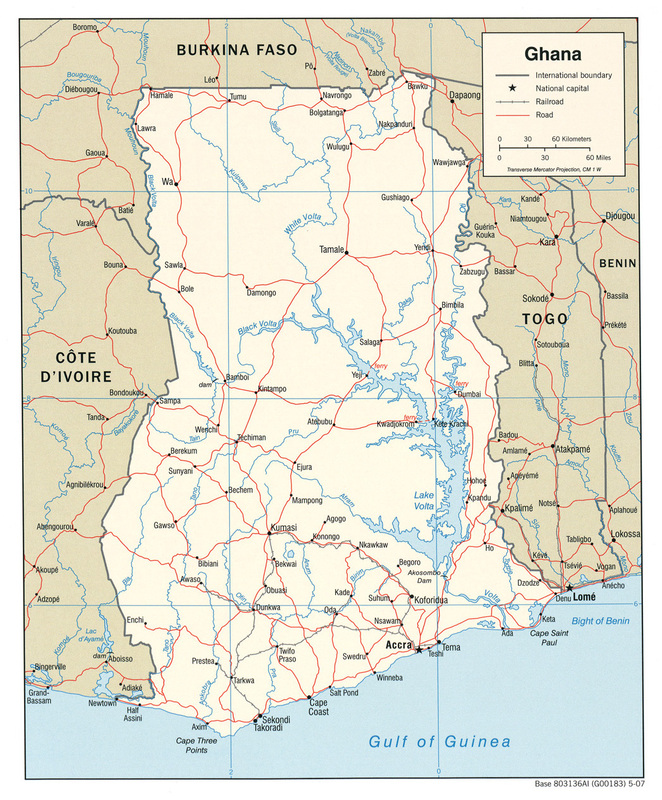 This year I will focus my efforts on schools in one region, in this case the town of Cape Coast and the surrounding villages (within one hours drive). In years past, much time has been spent traveling to different cities/towns/regions and visiting schools in many places. 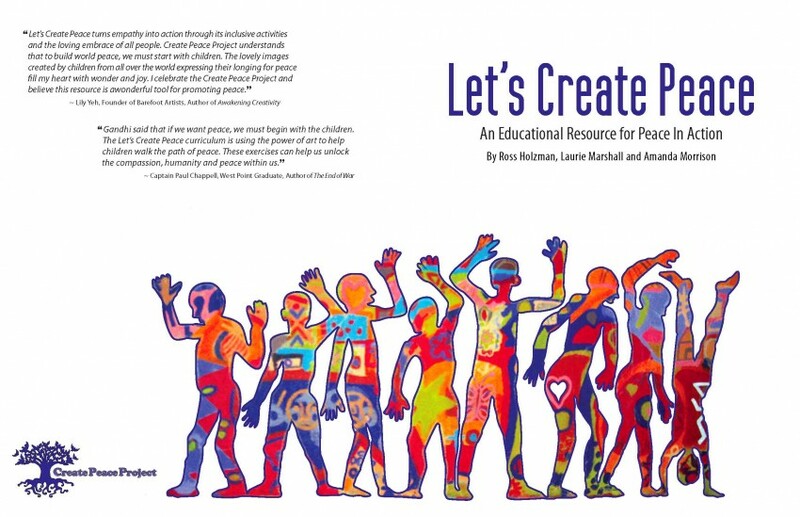 In Ghana this year I felt it would be nice to focus the energy of this art-for-peace project on one area and work with as many students as we could from one area….perhaps such that they will some day know and connect to each other on this level of peace and understanding. We have begun to visit schools. The interest is high and the excitement ever present from the children. It is always amazing to watch a vision manifest into reality with a bit of action, a few key relationships, and the courage to step out into the world and expose your heart for the benefit of the children. This is what I am up to and this is what The 2013 Peace Exchange is about. We much overcome our fears and doubt and come together to listen, learn and share with and from each other. We must cross the boundaries of our comfort zone and open our heart to sharing love with all those we come into contact. It is my hope that the children of Cape Coast, Ghana will feel the love and the care of the children in the US and Canada as shared on their peace cards. I also hope that the children will some day remember the experience they had, the wisdom they shared and heard from their classmates and peers about peace and how we can create peace and find it in their own hearts, bodies and minds to make the peaceful choice in their actions, communications and thoughts towards others and the world around us. In peace we come, with open arms and love to share from our heARTS! 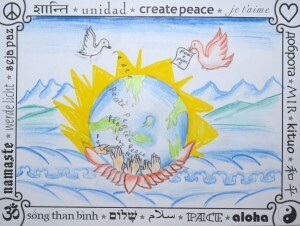 In 2009 and 2010 Create Peace Project included more than 3,000 students from schools across the United States in our first International art for peace exchange. The project was called Peace Pals and it was destined for Uganda where Create Peace Project partnered with In Movement: Art for Social Change. While in Uganda, Ross Holzman visited 30 schools and included more than 3,000 children in Peace Pals. Each one of those Ugandan kids created an original work of art and shared a message of peace as well as received an original peace card from a student in the United States. The response was amazing and for most of those Ugandan youth it was the first time they had handled a crayon, marker or colored pencil of any kind. Those 3,000 peace cards were brought back to the US. 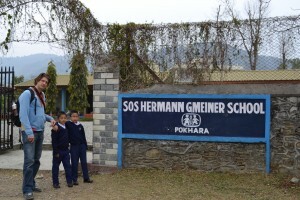 Some were returned to a few of the participating schools, and most of them were saved for the next exchange which was going to happen in India in early 2011. 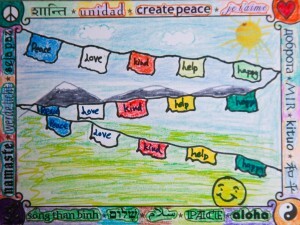 During the fall of 2010, another 5,000 peace cards were sent out to schools across the US and Canada, and nearly 3,000 returned in time for our departure for India in February of 2011. 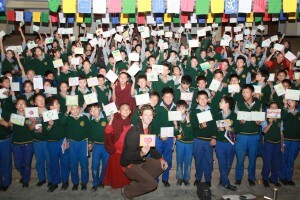 3,000 US cards along with about 2,000 Ugandan peace cards travelled to India with Ross and his professional photographer; Heather where they would be distributed to students in schools across Northern India. 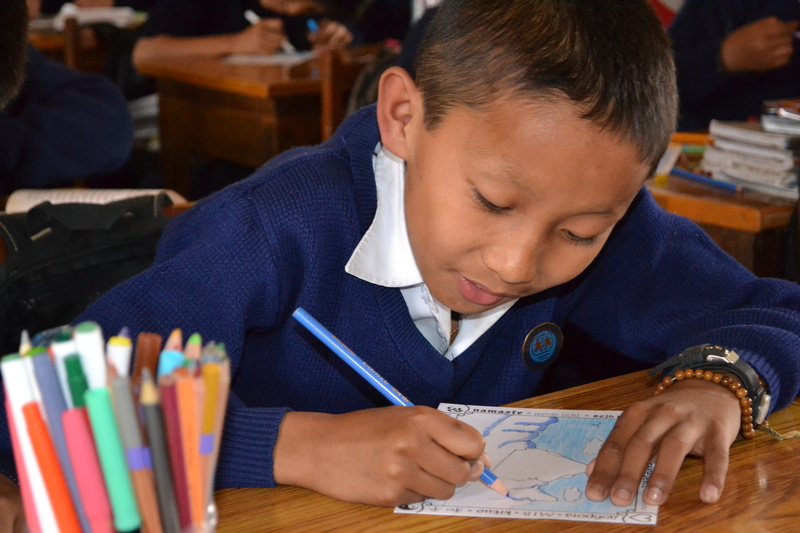 While in India Create Peace Project partnered with Pratham, one of the largest education NGO (non-governmental organizations) in the world and harnessed their support for visiting schools in numerous regions where they worked. In India, CPP had the good fortune of having numerous volunteer support in our efforts to include more than 5,000 students from 30 schools in many cities during our three months there. Again, the response was brilliant and the kids and teachers, parents and administrators loved the project. It was amazing to see the students in schools of all kinds effortlessly and easily sit for meditation and share their prayers for peace. 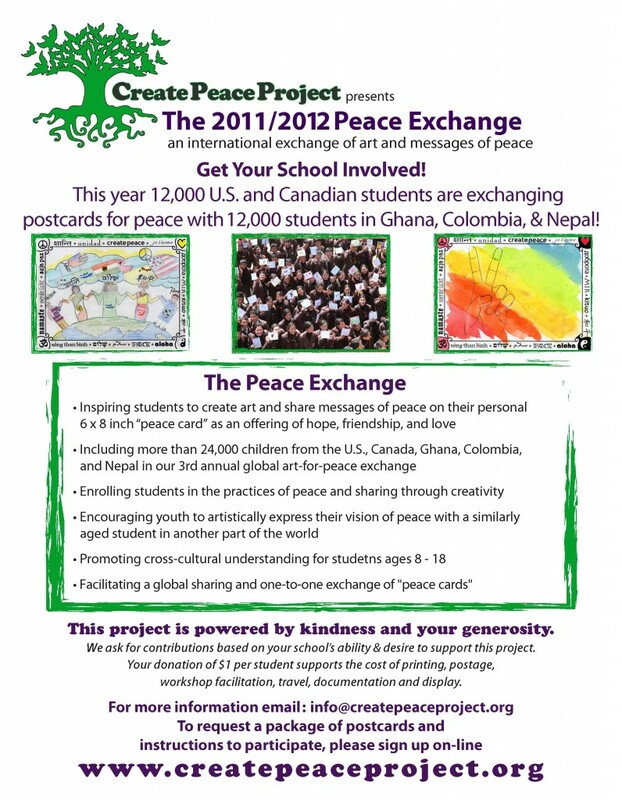 In 2012, Create Peace Project facilitated three exchanges between North America and schools/NGO’s abroad. We sent about 500 peace cards to Haiti with a group building a children’s center in Jacmel, Haiti. We did another exchange with about 1,200 students from San Francisco and Medellin, Colombia in partnership wtih Mi Sangre Foundation. 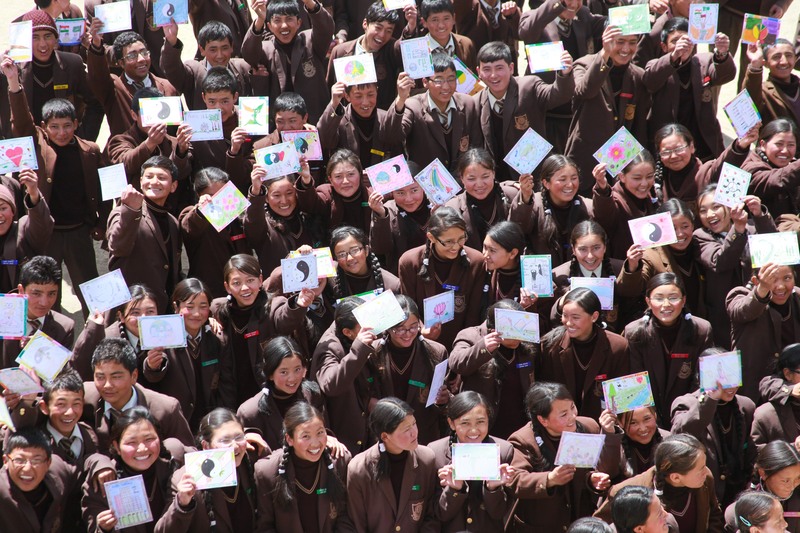 And we also included more than 5,000 students from 40 schools in the US, Canada, and Nepal in our 3rd Annual Peace Exchange, in which Ross Holzman traveled to Nepal and facilitated workshops in schools of all types in six cities around the country. We are excited by the continued growth of The Peace Exchange and are currently in development of a vision for a documentary film that would follow Create Peace Project around the globe to 20 or more countries, including 10’s of thousands of students in this international arts-for-peace initiative, and sparking a movement of art for peace wherever we go. 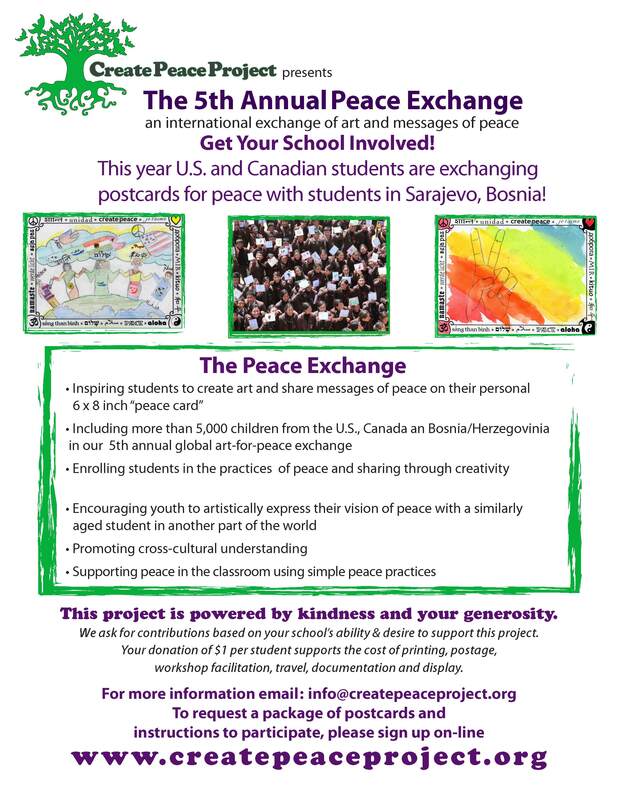 If you are interested in getting your school or youth organization involved in The Peace Exchange, please be in touch. 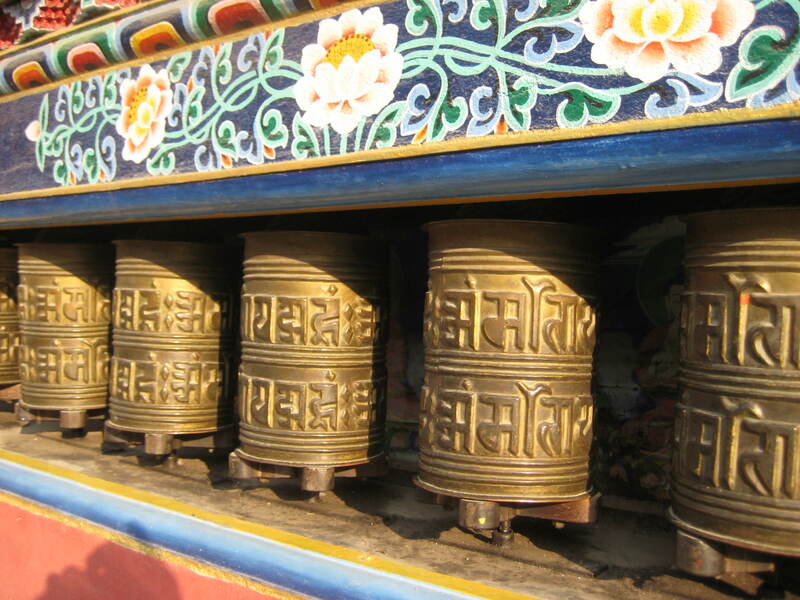 Leaving Dharamsala was hard. The workshops at TCV were very special. 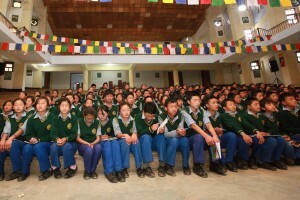 The situation in Tibet coupled with the beauty and warmth of these kids was indeed a magical and blessed experience. But it was time to go, and so we packed up and hit the road. It was me and Heather, plus our newest compadre Jeff, also from SF, and our recently found friend Mia from Norway. Six hours out of Himachal Pradesh and into Punjab we arrived in Amritsar. Amristar is home to the holiest of Sikh religious sites, Hari Mandir Sahib, aka the Golden Temple…and seeing as this is one of the most beautiful buildings in India, we wanted to stay close to it. In doing so, you must position yourself in a low “automobile” zone, where bicycle rickshaws, motorcycles and pedestrians dominate the streets. 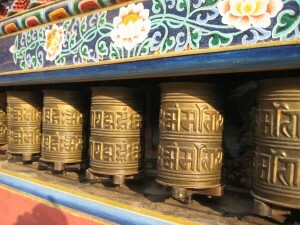 Some how the sounds of horns blaring and mad congestion is never ending on most streets around the temple. We settled into a reasonable hotel and got situated. The plan for Amritsar was to again partner with Pratham and visit Pratham schools. So Jeff and I met with the Pratham district coordinator Navjeet and the regional government coordinator Aman to discuss the project and create a plan for visiting schools. In Pujab, Pratham and the state government are working hand in hand to address the issues of child literacy and improving the quality of education for all government schools. A plan was made and we were all set to visit 3 schools over the next three days, on Tuesday Wednesday and Thursday. I am always a bit excited and nervous when a plan is set: where are the schools going to be, how far are we going to have to drive, what are the kids going to be like, how many kids are we going to work with, will there be a space to effectively host the group, will we be well received, etc etc. But once a plan is made, you just have to step back and trust everything will work out for the best. This is one key lesson on this trip. Trust. Let go of control and trust that someone else will handle everything for you. And you know what….it always gets handled and for that I am grateful. So on Tuesday morning our pal Aman, Regional Coordinator for Pujabi Education dept. met us at the hotel at 830am. Our buddy Navjeet, Pratham District coordinator for Amritsar, was in his car on the outskirts of the Golden Temple inner sanctum no-drive zone. So we walked to find him. Streets over-flowing with people even at this early hour of the day. The first school we were going to visit was about 10 minutes away. Jeff, Mia, Heather, Aman, Navjeet and I piled in to this four seater: three in front, three in back. We arrived with a warm welcome from the principal. Greeted with cold Pepsi, a gesture of respect and appreicition: offering the cold beverage, recently purchased showing “we bought this special, expensive drink to share with you, our special guest.” You drink it and enjoy. After a short explanation of the project to the principal, showing her peace cards and photos, we spoke about the quality of education in this school, and the population of socio-economically challenged students they served. It was apparent that lots of love and care was being taken with this population of young people and the principal, her right hand man, and a couple other teachers were expressing their excitement to have us present for this Peace Exchange workshop. The group of students, classes 6-12 were gathered in the multi-purpose hall awaiting our arrival. Chair lined the stage and a glass table was there for us to sit behind. I always find this moment an awkward one…to come into an auditorium of kids and be up on the stage, above them, then with chairs while they are seated on the floor. I often am the last on to sit, walking among and in front of them, making eye contact and saying hello. I like to make that warm connection with the students before talking to them. Usually, I will be requested to sit three of four times before I do. So I took my seat and allowed my friend Aman to explain the project and who we were and why we were there. Remember, let go of control. All will flow. 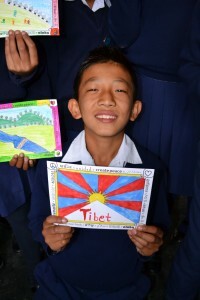 On Monday April 11th we arrived with excitement and joy in preparation for our first Peace Exchange workshop with the Class 6 students at the Tibetan Children’s Village upper campus, Dharamsala (Upper TCV). The group was awaiting us in the upper hall where we were warmly greeted. Prayer flags for Peace, previously created, hanging above the student’s heads were a pleasant surprise and lovely artistic addition to our morning. 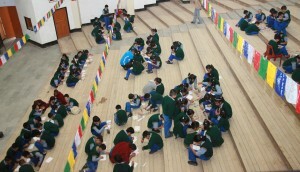 The Peace Exchange workshop involves several activities and takes about two hours to complete. After introducing this cross-cultural exchange of art and messages of peace, we ask the students to share their thoughts on peace and what peace means to them. By encouraging the students to share their ideas, we hope to inspire communal learning, rather than simply informing via the teacher to student dissemination. Several of the students stood and confidently shared what peace meant to them. We heard things like: “Peace is happiness.” “Peace is the most important aspect of life.” “Peace is kindness.” Adding to the children’s ideas, I took the opportunity to expand the thoughts and discuss the importance of compassion, forgiveness and acceptance as it pertains to our relationship to all beings. I also added to thoughts of “Peace begins in our heart,” and “peace is love” the idea that peace does begin with the individual and from their spreads out into the world. The students all confirmed their understanding and agreement. It is from this concept that peace begins with the individual and from their spreads out into the world that the Peace Exchange project was born. This project gives students the opportunity to do just that; create art from their heart and send it to an anonymous student abroad. Following a short discussion and conversation on peace, we took a moment of silence to connect to our hearts and energetically send that love and hope out into the world. A short, guided meditation allowed the group to calm and relax, consider what peace looks and feels like, and prepare them for making art. This was a beautiful experience in each of our workshops and we very much enjoyed feeling and seeing the students in prayer. While in silence, I asked the students to consider what peace looked like and what kind message they were going to share on their personal peace card. 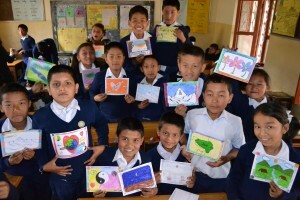 Following our peace meditation, we distributed peace cards and began the process of making art. The children were enthusiastic and easily grasped what they were going to do and quickly went to it. I always love seeing the wide eyes of the imagination take aim at the blank 6 x 8 inch postcard we share with them. For 40 minutes the students explored what peace looked like with images and color and shared messages of peace on the backs of their cards. 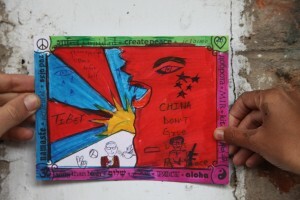 Many students reflected the Tibetan Flag in their artwork while commenting on the ever-present desire for peace between China and Tibet. Heartfelt messages and cries for peace were conveyed in many ways by this group of 10 – 13 year olds. Here are a few of the messages of peace written by these students that were inspiring: “Peace will prevail on Earth only when there is peace in the heart of mankind.” “Try to get peace within oneself. Peace is the key of happiness.” “I believe in peace so talk about peace, think about peace, create peace. Peace is to love each other. 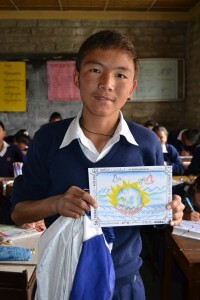 May peace prevail on earth.” The creativity among this group of Class Six students was very high. I was very impressed with their ability to express themselves clearly and beautifully with color, form, and image conveying what peace looked like to them. On Tuesday we retuned to Upper TCV and worked with two groups. 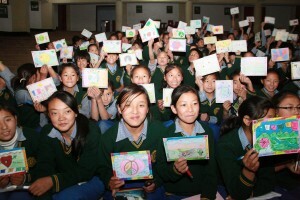 The first group of Class 4 and 5 was the largest Peace Exchange group ever to simultaneously do peace cards. We had 300 students in this first group. Following which 220 students from Class 2 and 3 joined us. This was a beautiful day. Hearts opening, amazing art work and powerful messages being shared, and an inspiring and beautiful group of Tibetan Children to work with. A very special moment was when one of the resident Monks joined me in the front of the room during the first group and led a morning prayer. This was an enriching and charged experience to both share and witness the students chanting a Buddhist prayer for peace. Tuesday’s workshops were equally as wonderful as on Monday. The students enthusiastically shared their ideas on peace, spoke clearly and confidently about what peace meant to them and why peace was important and we very much enjoyed our interactions with all of them. Our team of four was eager to hear, listen, and see what the students thought, felt and were creating as an expression of peace. Many similar ideas returned in the art work and messages, but this is only a testament to the beauty of the many themes being taught and conveyed around TCV. I very much appreciate the mottos of “Others before Self” and “Come to Learn, Go to Serve” that the school is constantly reminding the students. This wisdom and the richness of the Buddhist culture and tradition were clearly expressed in the artwork and messages of peace by all the students. On Thursday and Friday of the same week we visited the Lower TCV campus where we worked with the Classes 5 – 10. Three workshops in two days, more than 500 students, and an amazing time, sharing the Peace Exchange with the staff and students of the lower campus. 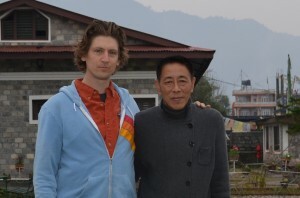 Some of the most touching and blessed memories from both schools was the support, and help of the teachers and administration who escorted us around and assisted us in translation, helped distributing supplies, lovingly sharing wisdom and knowledge with us about the school, the situation in Tibet, and making our experience a most happy one. The workshops at Lower TCV were even more active than the Upper School. Perhaps because they were older students, but there was a certain confidence and comfort that these three groups demonstrated that I hadn’t felt prior. Many students were eager to have conversation and interact with our group. They were excited and inviting of photos and at the end of the workshop enthusiastically requested autographs: which was an honor and warming experience for me. The art work and messages of peace continued to reflect the strong education and intelligence of the students and the beauty and nurturing environment of this school. Images of Tibet, of the Tibetan and Chinese flag joining, images of the 7 Lucky Tibetan symbols, and many more up lifting and positive messages of peace being conveyed in their art work. It is clear that the students of Lower TCV have a strong creative spirit and an enriched artistic life in this school. I was very pleased to learn of the art contests that happen throughout the year and to see the students art work hanging in the dining room where we art our lunch. I was very impressed with both schools on all accounts. I was very moved and touched by each group of students, their joy and happiness, love and light shining from their eyes. I am so grateful and honored beyond words by the kindness and connection of the students and the staff who joined us each day. I feel deeply blessed to have shared this project with your school and look forward to staying in touch for continued collaboration in the future.